So, in yesterday's print New York Times, the Metro pages brought news of Glee! The Retirees’ Talent Show. The Sports section offered For Potential Owner, a Background Check Worthy of the K.G.B. So, was news of yesterday's suit leveling serious charges against the Empire State Development Corporation (ESDC) regarding the Atlantic Yards approval worth an article in today's print newspaper? It was covered by the New York Observer, WNYC, Crain's New York Business, Reuters, and the Brooklyn Daily Eagle, plus the Record. Perhaps the once AY-focused Brooklyn Paper will catch up in due time. Editors surely have some Atlantic Yards lawsuit fatigue, given that last week brought news--covered only online by the Times--of a new lawsuit against the Metropolitan Transportation Authority and of oral arguments in the eminent domain case at the Court of Appeals. Editors must think Atlantic Yards gets too much coverage. That all the lawsuits blend together. That people are tired of it. But maybe--just maybe--Atlantic Yards is "this generation's Penn Station," to quote Kent Barwick, late of the Municipal Art Society and hardly a flamethrower. If so, then maybe the press needs to shine more light, not less, on the project. If not in print, then at least on the web. Maybe the performance of oversight agencies has been very questionable. Maybe the charges in the lawsuits should be taken seriously. And maybe it's important to follow the lawsuits, to evaluate the level of candor in the government's answers. Because, as noted in yesterday's lawsuit, there are some very inconvenient facts regarding the ESDC's unwillingness to acknowledge that the project might last 25 years. If so, a Supplemental Environmental Impact Statement (SEIS) was merited, and Forest City Ratner's December 31 deadline to issue arena bonds would've been jeopardized. The build-out of the Project is likely to occur in two phases, with the Project elements on the Phase I Site and the Upgraded Yard (collectively, "Phase I") anticipated to be completed by 2014 and the Project elements on the Phase II Site (collectively, "Phase II") anticipated to be completed by 2019. In June, however, an ESDC public hearing notice announced a 25-year deadline for Phase 2. 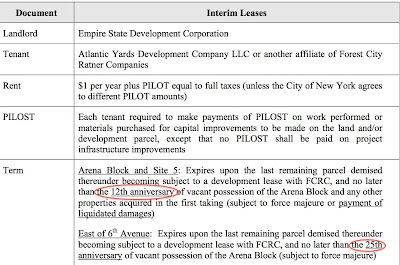 And, in an ESDC board memo (right) distributed September 17, the interim leases for the arena block and Phase 2 were described as lasting up to 12 years and 25 years. A Response to Comments document distributed to the ESDC board dodged the question. Comment 10: A number of commenters questioned the economic feasibility of the Project and the likelihood of completing the Project by 2019. Response: ESDC believes that the Project is financially feasible and that the relatively modest changes included in the MGPP do not warrant changing the original 10-year construction period for the Project approved by ESDC in 2006. ESDC and its construction consultant have reviewed the updated construction schedule and determined that it is reasonable. Does the ESDC think the ten-year period likely? It didn't say so. Indeed, the evidence from the MTA and the ESDC's own leases indicates that the timetable is unlikely and nearly impossible. WNYC yesterday reported: A spokesperson for the state's economic development agency says officials expect construction will take only 10 years. NoLandGrab's Eric McClure commented: "Officials" are either sadly mistaken — or lying. Maybe a judge will get to decide.